Our main geographies are the UK, US and Far East. Over the last 100 years we have created iconic buildings and infrastructure all over the world including the London Olympics’ Aquatic Centre, Hong Kong’s first Zero Carbon building, the world’s biggest shopping mall in Dubai, the National Museum of the Marine Corps in the US and the Channel Tunnel Rail Link. 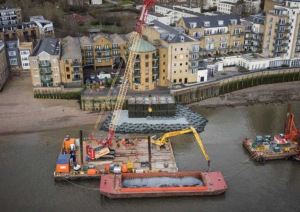 Over the last 20 years, we have delivered more than 75 coastal protection and flood defence projects amounting to over £500m for clients including local authorities and the Environment Agency (EA). We have reduced the risk to approximately 100,000 properties on schemes completed since 2010. Register as a supplier on CompeteFor to receive email alerts of Balfour Beatty sub-contracting opportunities on this project.